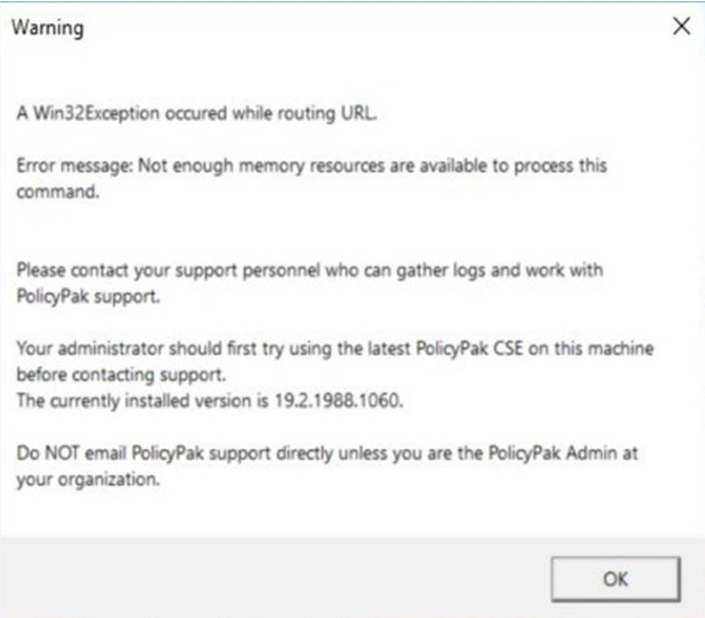 Please make sure you are using the ABSOLUTE latest PolicyPak Client Side Extension and then attempt to reproduce. Even if PolicyPak Browser Router has had no changes in a previous build, it’s possible that another part of PolicyPak has caused the issue, we know about it, and have possibly fixed it in the latest Client Side Extension. Some other security software like: McAfee, Carbon Black, Ivanti LES (HEAT), etc. Sometimes an upgrade in THESE kinds of software will break and “beat up” on PolicyPak. So everything was working yesterday, but then stopped working AFTER you made an upgrade to one of these pieces of software. A good test would be to remove or roll it backward or exclude PolicyPak from these specific pieces of software. For your AV / other software, see your own vendor’s exclusions. If you have a FEW or ONE machine showing the issue: FAQ. After that, it could still be a bug. But it would typically appear on MANY machines and not just a SINGLE or a FEW machines. That being said, if you would like for us to check out your logs, in these cases, we need AT LEAST TWO machines to see a PATTERN in the logs. So be prepared to get logs from multiple machines showing the issue so we can do some deeper investigation. Here is how to get us the log files AS USER and as ADMIN. Remember: We need AT LEAST two machines of logs to check in this case.